Just recovering from another cold, it seemed a good time to do a top to bottom spring clean of my body by feeding it nutrient dense, raw, vegan food and juice. For three days. 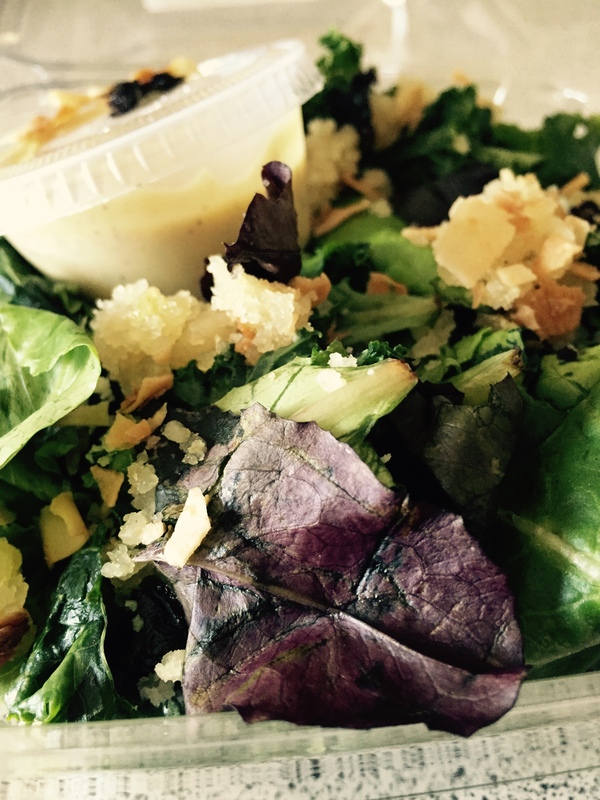 For three days, quinoa, cabbage, tofu, miso, squash, nuts, seeds, and leafy greens. For three days. I’m done. I plead mercy, and bow deeply to those people who eat this gorgeous healthy food as a lifestyle choice. 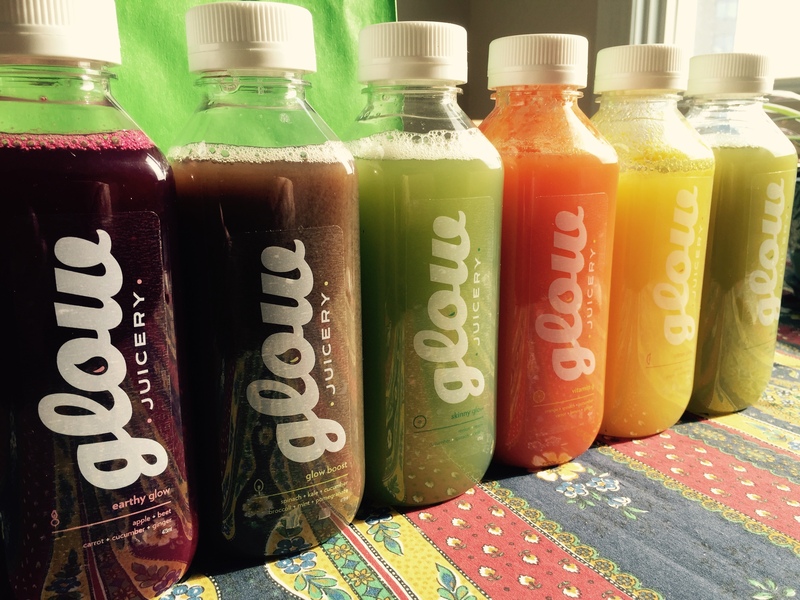 You cannot be impulsive to do the Raw Food + Juice Cleanse through Glow Juicery. You need to book it in advance, and also start a pre-cleanse routine before you get your food. You do this by eliminated caffeine, processed food, wheat, dairy, sugar and alcohol two days before your cleanse. And yes, a person could save themselves $165 and just cut out those foods from their diet and feel mighty fine. But what does $165 get you? Three breakfasts, three soups, three salads, three “energy snacks”, bottles of almond milk, bottles of fresh juice, a menu plan and a recommended eating schedule. The juices are terrific. Absolutely delicious. I am a convert and have felt great since drinking these. They are fresh, tasty, and just plain make me feel good about myself. The food. This was the Day 1 breakfast: This particular item didn’t have a label on it, so I had to figure out what it was. On the base there, is a grain soaked in probably almond milk. I think I saw oatmeal and quinoa, possibly hemp. 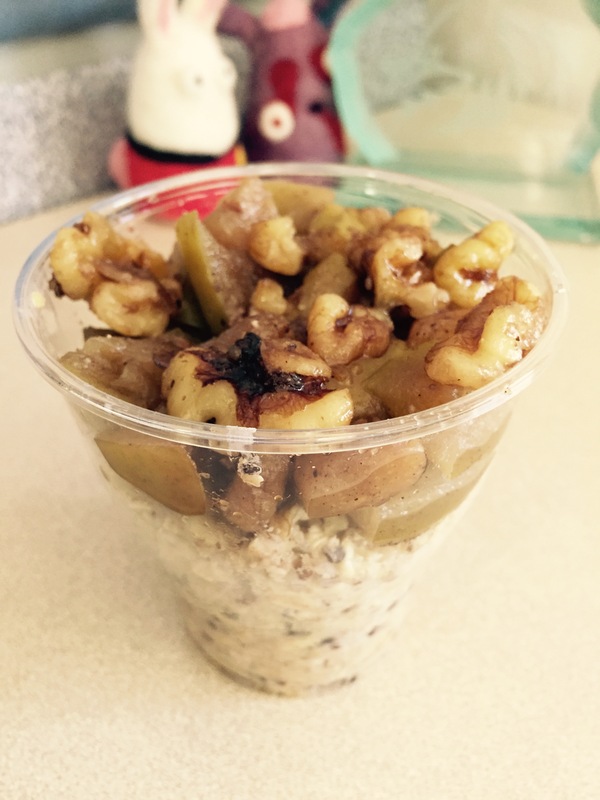 The topping was a delicious cinnamon infused fruit (apple or pear) and fresh walnuts. We were off to a good start. For lunch, it was soup. This item had the ingredients, but did I have to sense to take a photo? Or write it down? No, but that could be because I was getting weak with hunger. All I remember about this soup is the main ingredient, kale, and the texture. And here is where things went sideways. Everyone has experienced overripe bananas right? Some like it, some don’t. I don’t. It has nothing to do with the flavour, I love banana, but it has to do with texture. It makes me gag. So here I am with my lunch. I did a few tentative stirs hoping it would suddenly become a warm cream soup, but it didn’t. It stayed cold and thick and mashed banana like. I took a few tentative licks off my spoon. It tasted great. Fresh. Healthy. A bit of zing. 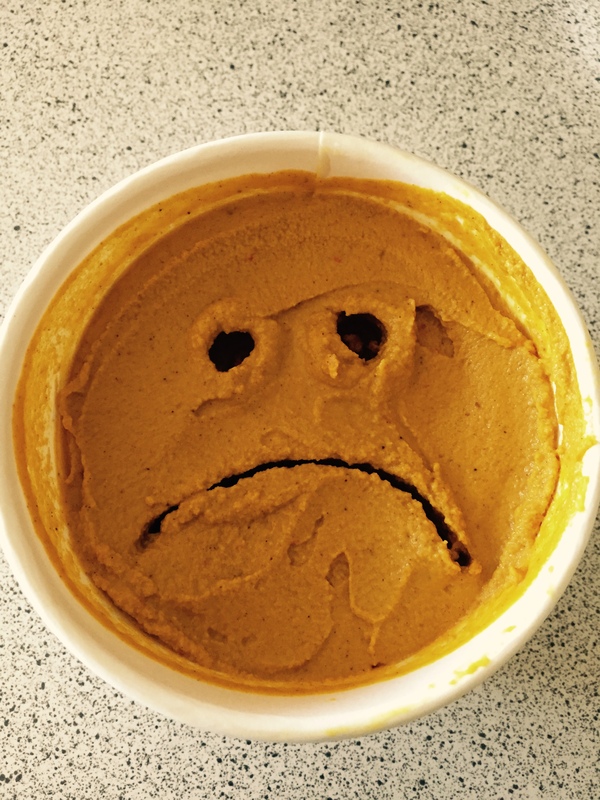 But could I stick a spoonful in my mouth? No. I had soup spoon yips. I’d get the spoon to my mouth, but just could not get it in. So I took tiny licks of soup for about 40 minutes, then gave up. I tried though. I tried. I thought my afternoon snack would save me. Here it is: The promise of something chocolatey with coconut would warm anyone’s heart. So I was excited when 2 pm rolled around. I took my first bite. Chew. Chew. Stop. Do a few of those chews with the mouth open, hoping either the extra air will help the flavour, or hoping the food falls out. It had a very familiar taste, but not a taste one should be chewing. I thought about it and realized, Vitamin B! If you ever had a bottle of Vitamin B in your cupboard, you are probably aware of the smell. 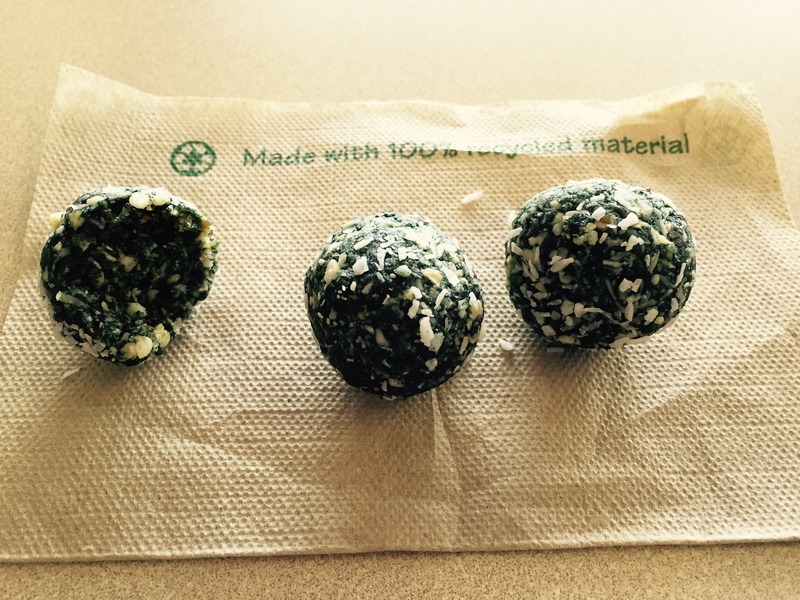 These three balls tasted what Vitamin B smells like. This isn’t a bad thing. It actually helps the whole “Look at me! I’m healthy! I’m eating Vitamin B balls!”. Supper was a pretty salad. Now about supper. You’d think I’d be starving by supper time, but truthfully I was doing just fine. No, really. I’m not just saying that. In between there I had another juice which can be surprisingly filling. But then, it is Day 1, and Day 1’s are usually always successful for me. It’s about sustaining Day 2…. Breakfast on Day 2 was a container of something (looked like tapioca), in almond milk. I love tapioca pudding. This wasn’t tapioca pudding. You can just see it there to the right of the red bottle of juice. I abandoned breakfast in favour of a juice, again, because of textural issues. Lunch was a salad. These take me an enormous amount of time and energy to eat. They are tasty. They ooze health, vitamins and energy. I’m a person who is used to tuna sandwiches or left over pasta. I struggled, but I ate it. And then, supper. 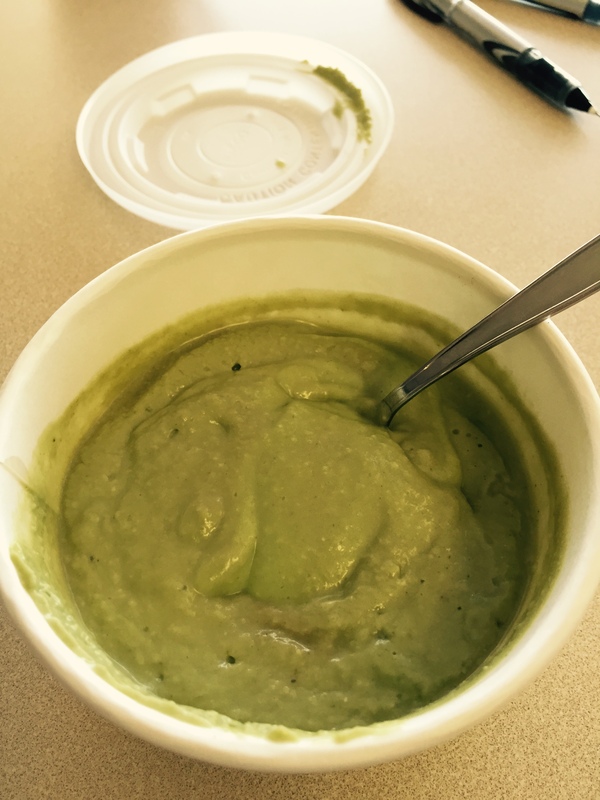 Here it is: Another thick soup… this one was squash based and also very tasty. But the texture. I couldn’t do it. So I thought I’d have Day 3’s soup on Day 2: No textural issues here, except with the seaweed. And the tofu. 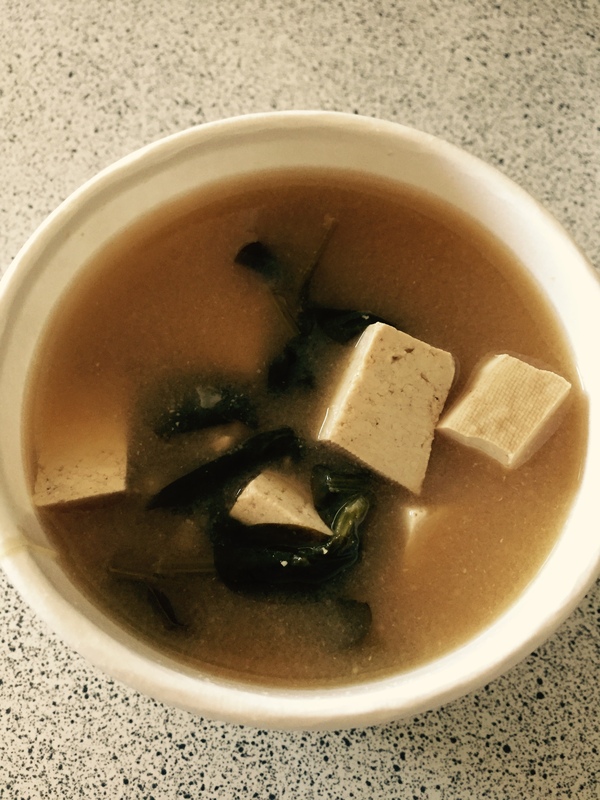 This miso based soup was mighty fine, but I gave it up and had another juice instead. Day 3 started with white toast with butter. I’ve packed smokies, white buns, ketchup, a bag of Lay’s potato chips and a bottle of red wine for our trip to Jasper. The remaining juices will be brought along. A raw food and juice cleanse is not for everybody, especially those of you who may have not eaten vegetables with any regularity since childhood. I just warmed up to vegetables in the last 10 years, and even now, they have to be done just right for me to eat them with enjoyment. This usually means roasting peppers with olive oil, grilling asparagus and topping with olive oil and lemon, or tossing romaine lettuce with a generous glug of olive oil and balsamic vinegar. Although I don’t believe in detoxifications as many health sites on the web will promote, I do believe in clean eating from time to time to treat the body to a little rest and relaxation. 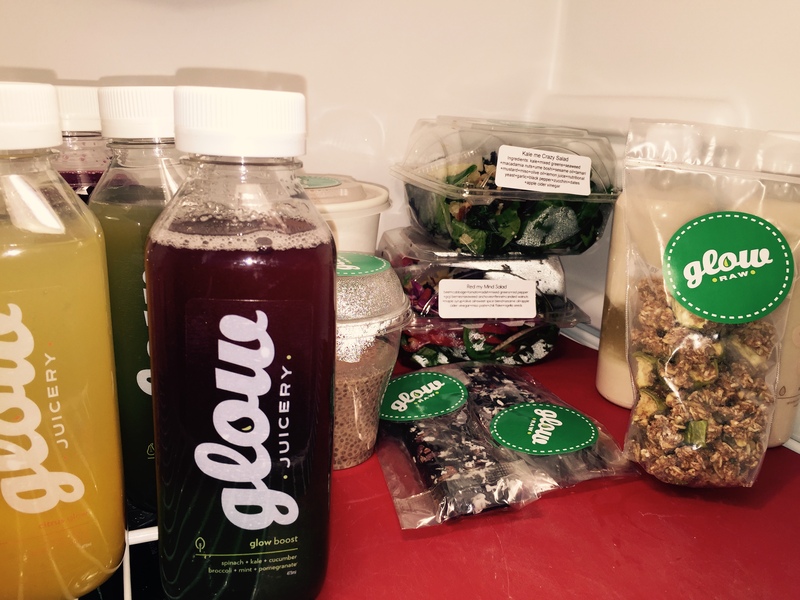 I am particularly impressed with Glow Juicery‘s core belief that food is medicine and fuel for our bodies. I wholeheartedly share that belief. If my relationship with food was limited to that statement, then I would have one awesome, healthy body. Fortunately, or unfortunately though, I also believe food is meant to be a pleasurable experience of taste and smell (like the smell of roasting meat, the taste of fresh baked bread), something to share with friends and family, and an excuse to open a bottle of wine. That is why my body is a little worse for wear, but I’m willing to make that sacrifice. 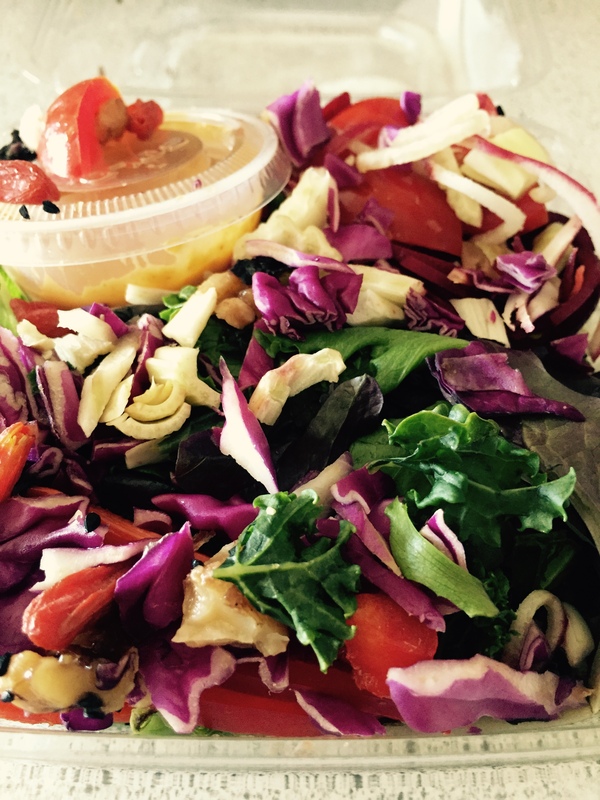 Clean eating is a lifestyle choice for certain, and I admire those people who are able to do it with regularity. I can do it for a day or two, but the food-is-pleasure culture I’ve been exposed to since childhood usually wins out. Do try it for yourself. You may become a convert. Glow Juicery‘s staff are pleasant and will bend over backward to help you out. If anything, treat yourself to one of their fresh juices and feel better for it.